Hi and welcome to ‘Weaning Wednesdays’. I have decided to change this linky to run fortnightly. As it is such a niche subject I think it will do better and we will have more to read with it being done this way. You can link 2 posts so if you do a weaning post a week you can still link them all up. This weeks special mention is First Tooth with 6 ways to help your baby love their food. If this is your first time here I would love to see you join in. A place to link up all your weaning, baby and toddler food related posts. Anything goes; recipes, styles of weaning, reviews, competitions, vlogs, even just a messy picture. Please make sure you add the badge. Please comment on at least the one post before yours and the host post. Tweet me @mummyandmonkeys using the #weaningwednesdays and I will re-tweet your post. I will be picking favourites and featuring them on the next week. 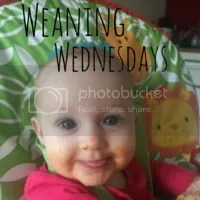 I will also pin your posts to Pinterest on the Weaning Wednesdays board. If you have any questions or are unsure of how to link, tweet me and I will try and help. The linky will open fortnightly on a Wednesday and run until Sunday at midnight. "5 Kind Tips – How to get your baby to sleep"